Lowly have announced details of their second album Hifalutin, released 12th April via Bella Union. The band have shared a first track entitled ‘Baglaens‘, and shared a short video introduction to the album which can be viewed below. They have live shows planned which will be announced soon. Lowly’s debut album, Heba, was a feast of dramatic dream-pop. Yet Hifalutin is more ambitious still. The album was primarily recorded in a 150 square meter warehouse, just outside the city of Aarhus. 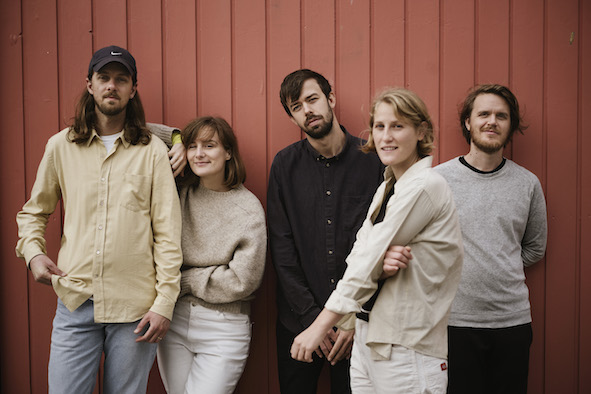 Band members recorded their parts as individuals and as a group; meanwhile, the producer, Anders Boll, placed microphones in nooks and crannies of the enormous space, all the better to highlight the dynamics between the band members. Last autumn, they played a concert in Brønshøj Water Tower, in the suburbs of Copenhagen, where the reverb was long and pronounced. The band had to carefully reconsider which notes and chords they could play; too many tones would muddy the sound. Pieces from this concert would find their way to Hifalutin. “Our lyrics consist of images and scenes that briefly glide into one’s field of view, and then disappear again,” co-lead singer Soffie Viemose explains. “We’d rather show something than say something quite literally.” An invitation sent from and to curious minds, Hifalutin is luminous modern pop at its most delicate and robust, assertive and open-ended.